Mike Phillips is unsure of his playing future beyond the end of his Racing 92 contract, which expires at the end of the season. Phillips, 33, has announced his international retirement after a 12-year career in which he won 99 caps. He told BBC Radio Cymru he would not rule out a return to a Welsh team. "My agent is trying to look for a club at the minute," the scrum-half added on BBC Radio Wales. "I guess over the next month or two it will sort itself out. "At the minute there's a bit of uncertainty, but at the same time I'm looking forward to the future as well." But Ospreys head coach Steve Tandy has ruled out Phillips returning to the region for next season. Phillips made 60 appearances in four seasons for the Swansea-based side. "No, I think Mike at the age he is at he's been an outstanding international and represented the Ospreys really well," said Tandy. "But Mike is experienced and was a British Lion but we are pretty comfortable with our 9's at the moment." Phillips, who was the British and Irish Lions first choice half-back in both 2009 and 2013, began his career at Scarlets before winning his first Wales cap against Romania in 2003. He joined Cardiff Blues in 2005 and left for Ospreys in 2007, before moving to French side Bayonne in 2011. 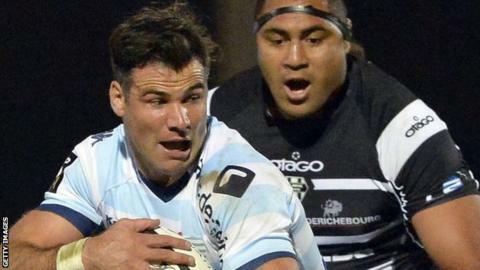 His time there ended over allegations of turning up for training drunk, and he signed for Paris-based Racing 92 in December 2013. Newport Gwent Dragons are the only Welsh region Phillips has not played for. "It would be nice maybe to finish my career in Wales," Phillips told the BBC's Welsh language station Radio Cymru. "But we'll see what happens over the next few weeks. "At the moment I'm just concentrating on playing for Racing - that's hard enough as it is." Some of Welsh rugby's legends joined Phillips' former international team-mates in paying tribute to him. Gareth Edwards - widely regarded as the greatest scrum-half to have played the sport - said: "He was a main cog of a very proficient Welsh side for a number of years. "He was certainly one of the best players in the world at his time; a huge contributor to Welsh rugby over the last decade or so." Clermont Auvergne, Wales and Lions centre Jonathan Davies hails from the same Carmarthenshire village of Bancyfelin. He said: "He's pretty much won games by himself. I loved playing with him. I've got a lot of great memories with him, especially on the 2013 Lions tour to Australia. "We're both very proud of where we come from and I think he's represented himself and the area with huge pride. What he's done on the field has been spectacular." Davies' thoughts were echoed on social media by Gloucester's former Ospreys fly-half James Hook. "Loved the last 10 years playing alongside one of my best mates @mikephillips009, one of the top 9s in the world for so long, 99 international caps an unbelievable achievement," Hook said. Northampton's Wales and Lions wing George North tweeted: "Massive respect for the man that is @mikephillips009. What a great international career. Been a massive part of mine."